It may seem a little early to be thinking about Halloween, but if you are hoping to grow your own pumpkins this year, it is actually already a bit late in the game. This is a great project to do with your children and a fun way to introduce them to backyard gardening. Growing pumpkins can help them begin to understand where food comes from, and they may find these fast-growing, expansive vines much more interesting than other plants in your garden that kids might find a bit mundane. Pumpkins are also easy to grow, and the plants are easy to care for, which makes this gardening project a fun option for folks who were not born with a green thumb as well. If you want to grow your own pumpkins for Halloween this year, the time to start is now, so read on (or print this post) for your guide to growing pumpkins, and then head to your local garden center to grab your supplies. If you have some gardening experience, you might be thinking: Isn’t it a little late to be planting pumpkins for use in October? In some parts of the country it would be, but they grow faster in warmer areas, and Southern California is definitely a warmer climate. This is why you can still get away with planting pumpkins now in hopes of harvesting them in time to carve them for Halloween. The ideal time to plant pumpkins in warmer areas, like Southern California, is around the end of May or the beginning of June. If you live in the desert or mountains where frost is an issue, you will want to wait to plant your seeds until after the last frost. If starting from seeds, you can actually start your seeds indoors as early as March, and then transplant them to your backyard garden once the weather warms up and the seeds have gotten a solid start. However, I have never had a problem with sowing the seeds directly into the soil in the raised garden beds in my vegetable garden. If you are planting your pumpkins in July, you might want to check your local garden center for starter plants that are already going strong and can be transplanted into your garden. This will give you a nice head start, but you can also plant seeds and get some good pumpkins by October. If you are planting late in the season, you will have the best chance of getting some good pumpkins by Halloween if you choose a smaller variety that will have time to mature before the big day. Where to plant your pumpkins is probably one of the most important things to consider, because this particular vine really likes to spread out and takes up quite a bit of room. You may want to plant your seeds or starters along a fence, in an empty flower border, in a side yard or along your house where you do not have other things planted. These fellows can easily grow to be about 30 feet long (or longer), so keep that in mind when you are picking the best spot in your backyard. Picking a spot next to a fence or structure can also provide some wind protection for these wind-sensitive vines, so if you live in a particularly windy area, you will want to take that into consideration. Pumpkins are sun lovers, so make sure the spot you pick gets plenty of sun. Whether sowing seeds or transplanting from indoors or a nursery, you will want to prepare the soil first. Regular potting soil for vegetable gardens is a good, simple start and will work just fine for most folks. A humus-rich soil is a good choice, and pumpkins enjoy a little nitrogen, so if you test your soil and it is lacking, you may want to amend it before planting. Pumpkin varieties vary greatly, particularly in size, so you will want to check your seed packet for the recommended distance to leave between plants. You should plan to at least allow about three feet between plants, and it is best to make a single row to allow those vines to sprawl out and grow freely to their full length without crowding each other. You can train the vines to encircle the plants, which allows you to better control the space each plant takes up, but this can make harvesting and watering a bit trickier once your plant is mature and, if done improperly, it can cause the plant to shade itself, which can cause problems. If you are sowing seeds, push them about one inch into the soil. Most Southern California homeowners are not going to need to worry too much about excessive rainfall, but you if you happen to live in an area where drainage could be an issue, then it is best to sow your seeds in mounds. Once your pumpkins begin to sprout, you may want to add a bit more compost or potting soil around each plant to give them a little nutrient boost. Pumpkins grown in wetter climates need little watering; however, those of us living in Southern California will have to water our plants regularly. As long as we are experiencing drought conditions and managing our gardens under mandatory water restrictions, you will likely only be able to water your pumpkins two days each week. This is actually just fine, since — like most plants — deep, infrequent watering is best. Water your pumpkin plants deeply on your designated watering days, and your plants should do just fine. Pumpkins, like other squash, are prone to fungal diseases, so you will need to keep an eye out for this. If you begin to see a white, powdery substance on the leaves, fungus is likely setting in. At this point, you may want to try spraying the leaves with a little neem oil or an anti-fungal solution from your local garden center. You can help prevent this from happening by watering at the base of the plant, not getting the leaves wet and watering in the morning. A little fertilizer every few weeks will help your plants thrive, but be sure to use a time-release formula to avoid burning your plants or giving them too much of particular nutrients, which could harm them. You will need to pull weeds around your plants as they grow to keep the weeds from competing with your pumpkins for nutrients and water. If you begin to notice aphids clinging to the bottom (or sometimes the top) of the leaves, your first line of defense is to spray the leaves with a strong steam of water to dislodge them. There are lots of home remedies for aphids, including spraying the leaves with soapy water or spraying the leaves with neem oil. You can also introduce beneficial insects, such as ladybugs, that will snack on the aphids or try an organic pesticide from your local garden center. To ward of some pests that like pumpkins, such as squash bugs, plant marigolds around the perimeter of your garden (or around where your pumpkin vines are going to grow). An added benefit of planting marigolds is that you can cut the flowers to use for Dia de los Muertos (Day of the Dead) celebrations, which take place right after Halloween. Keep an eye on the moisture level of the soil beneath your pumpkins. If they are sitting on soil that is too moist, they may rot. If you would like to personalize your pumpkins with your children’s names or Halloween sayings, you can carve your message into the shell of the pumpkin as it is growing. A scar will form, and your message will be etched into the pumpkin as a fun surprise for your kids or guests after they are harvested. Different varieties take different lengths of time to mature, but most pumpkin varieties fall somewhere between about three and four months. The most important thing to look for is a hardening of the shell, because without this, your pumpkins will rot quickly. Once the shell has hardened, you can use kitchen shears or a knife to cut the stems. It is best to keep the stem as long as possible; at least six inches is best. A good stem is key to keeping your pumpkins from rotting prematurely, so do not pick your pumpkins up by the stem and try to keep the stem intact. As mentioned above, keeping a long stem on your pumpkins is one of the best things you can do to help ensure longevity. 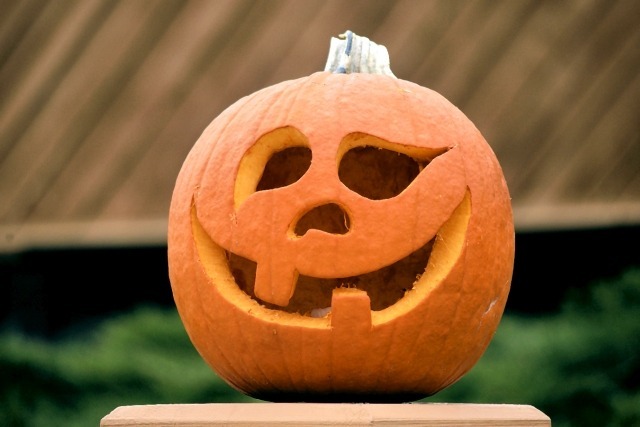 It is best to display your pumpkins whole for the first part of the month in order to avoid rotting, and then carve them just before Halloween. 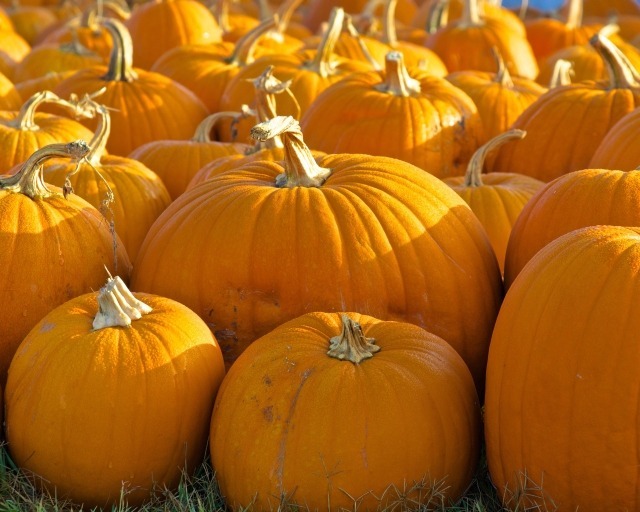 Keep them out of the sun and away from moisture, and avoid placing them directly on surfaces that will allow moisture to gather beneath the pumpkin. 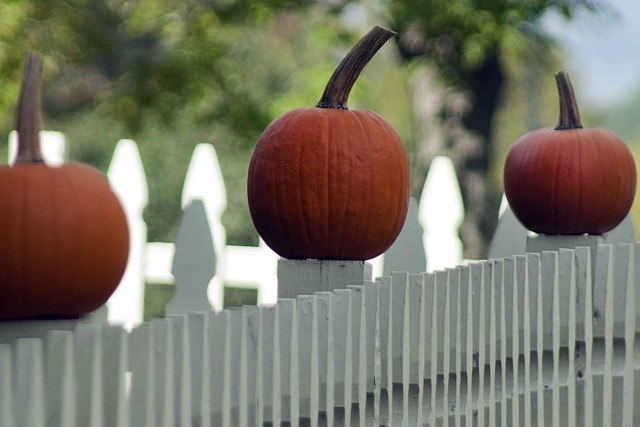 While it might be tempting to keep them inside until it is time to carve them, they will stay fresh longer if you keep them outdoors out of the sun. 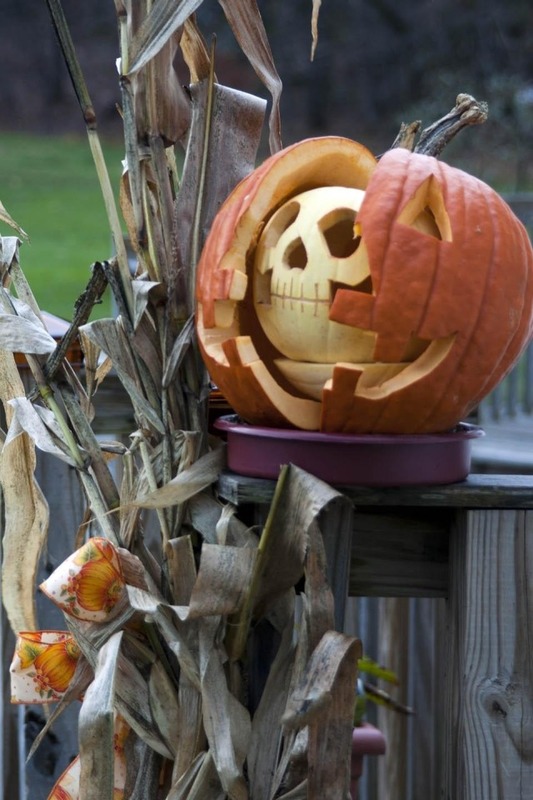 Most folks who grow pumpkins for this holiday are probably planning on carving them, but creating unique jack-o-lanterns is not the only thing you can do with them. 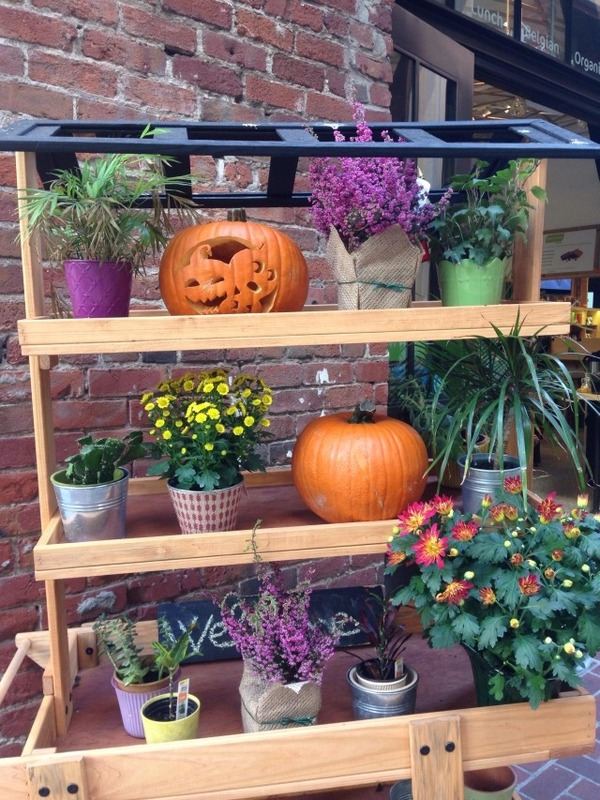 If you display them whole, they can last you throughout the fall and into winter as a colorful outdoor decoration. 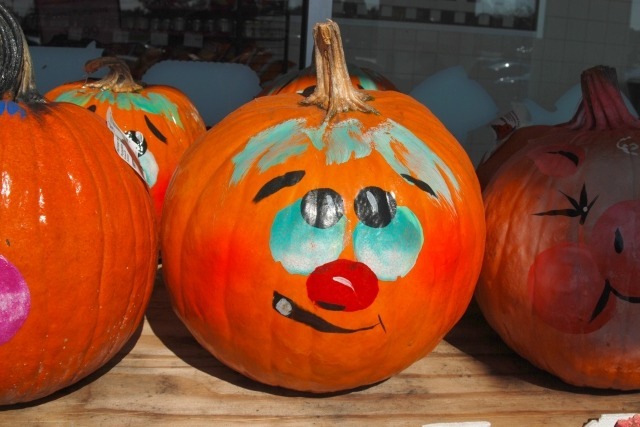 This does not mean that you cannot decorate them for the holidays; you can paint a jack-o-lantern face or Halloween message on a whole pumpkin for a display that lasts much longer then their carved counterparts. If you do carve them, be sure to save the seeds, which can be roasted for eating or dried to save for next year’s planting. If you want to save your seeds for next year, you will need to wash them well, spread them in a thin layer on some paper towels and allow them to completely dry. Once they are completely dry (this is important to avoid mold), you can store them for use next year. 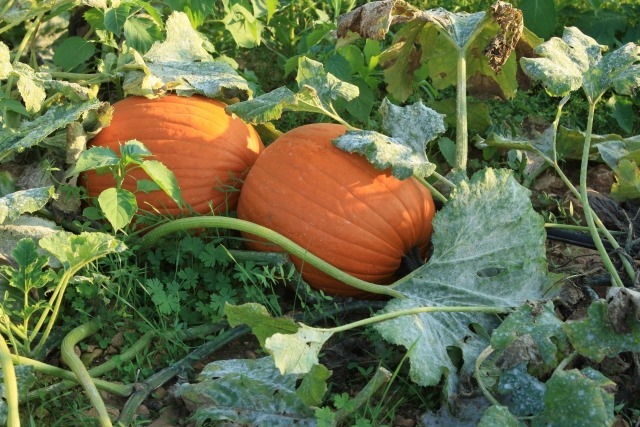 Once you are finished displaying your pumpkins, they make a great addition to your compost bin. 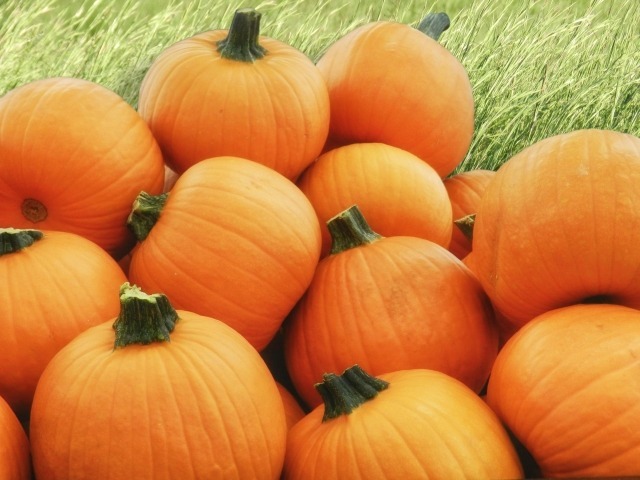 What are your favorite tips for successfully growing pumpkins for Halloween?